Power is an essential element of climbing performance. 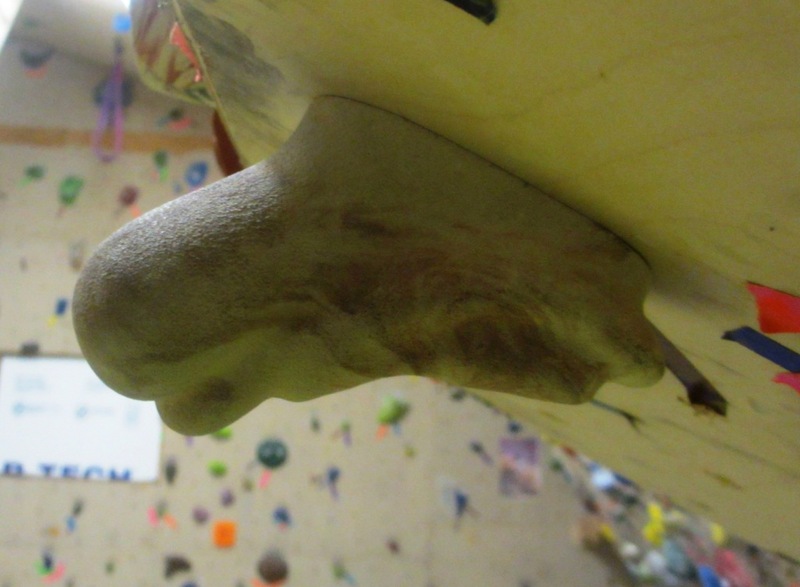 One could argue (and many have) it is the most critical physical aspect of climbing performance. As Tony Yaniro famously said, “if you have no power, there is nothing to endure”. If you cannot execute the hardest individual moves on your goal route, everything else is moot. It’s certainly true that every performance-oriented climber can benefit from improved power. Last year, I discussed at length how to use a Campus Board to improve power. 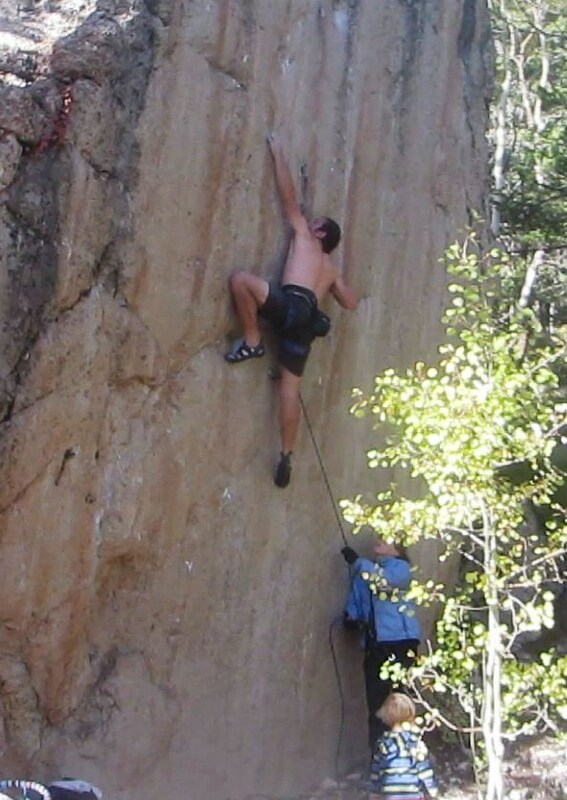 While highly-effective at developing pure power, Campus Training is only moderately specific to climbing. 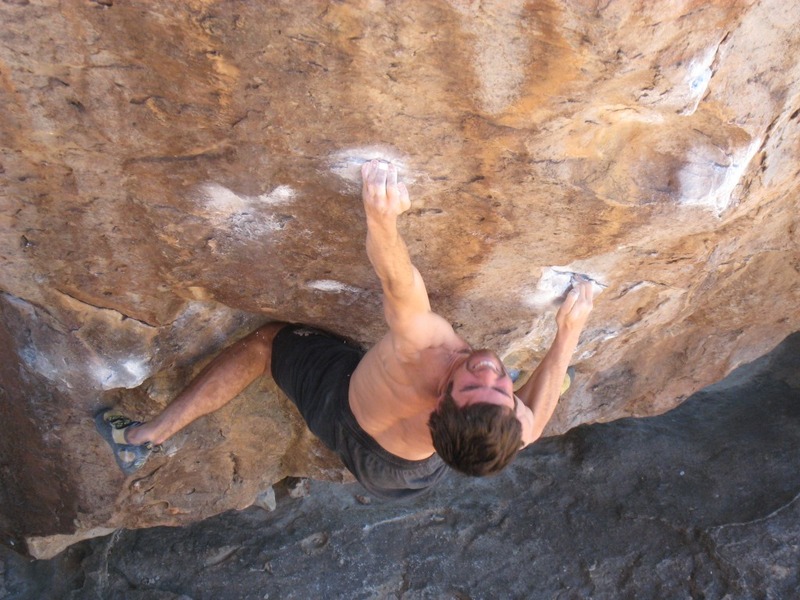 Bouldering can provide ultra-specific and effective power training, provided it is done “properly”. 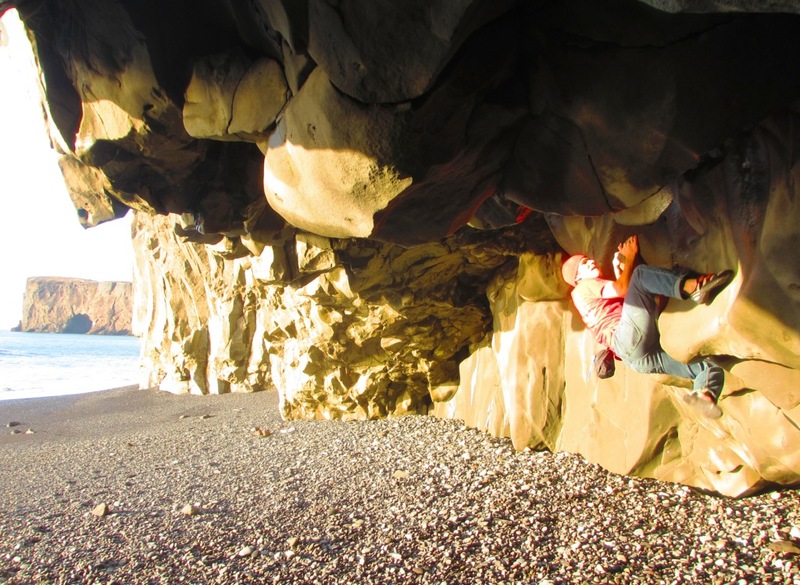 Bouldering can be great fun, and that can present a problem for climbers-in-training. The casual nature of the activity makes it easy to get side-tracked on problems that are unique and challenging, but perhaps not ideal for facilitating improvement. As discussed here power training must be extremely intense and brief to be effective. 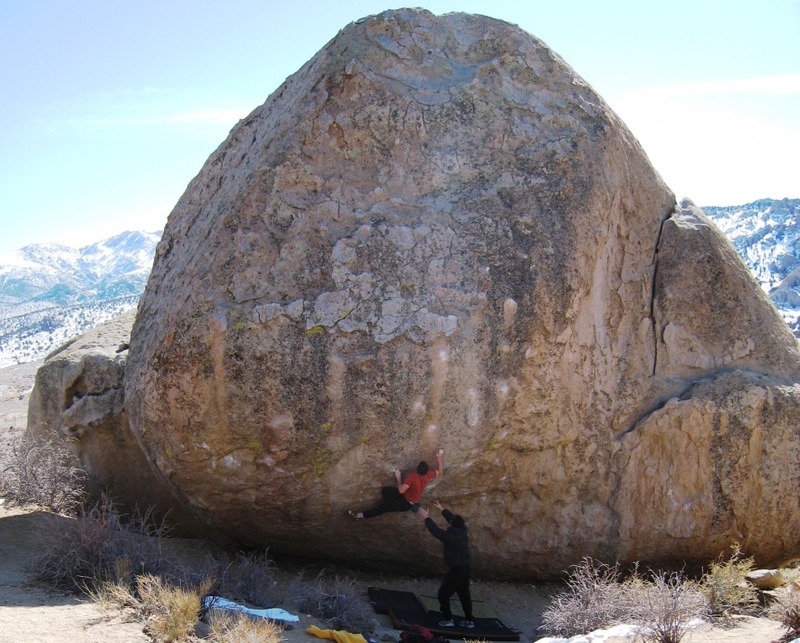 Many boulder problems have far too many moves to provide effective power training. The challenge of such problems is not in executing a single powerful move, but in linking several moderately-difficult-yet-pumpy moves. This is Power Endurance training at its finest–it has its place, just not in your Power Phase! Above I hinted at the other major pitfall of bouldering, when I wrote that Limit Bouldering should feature realistic moves. It is well-known that training must be “specific” to be effective. That is, if you are training for a route whose crux involves half-pad crimps up a 10-degree overhang, you would be best served training on half-pad crimps, and Limit Bouldering on a 10-degree overhang (if you climb routes in North America, it is quite rare that you ever climb anything steeper than 30-degrees overhanging, even at crags like the Red, Maple, and Rifle). 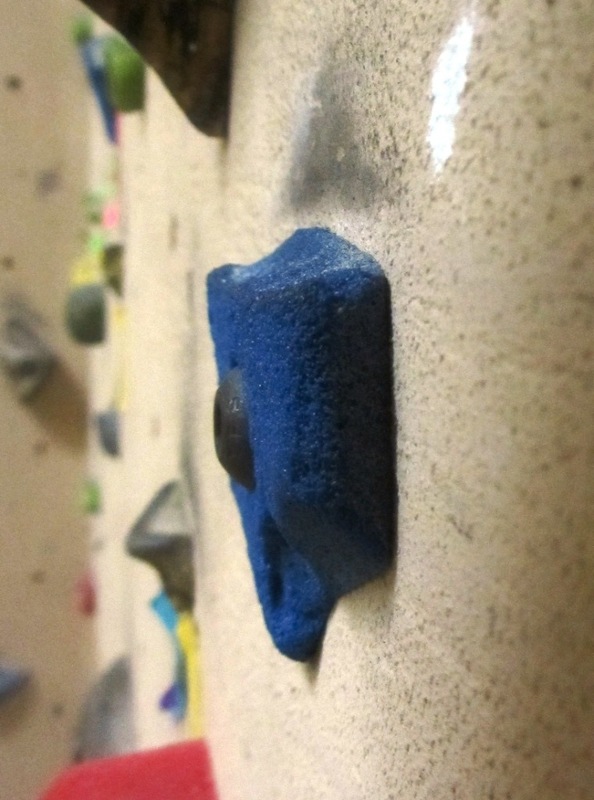 However, many indoor bouldering venues devote only a tiny fraction of their terrain to walls that overhang 30-degrees or less. Instead they favor terrain that is just plain too steep to be realistic. Steep terrain is really fun, and everyone wants to be the hero swinging monkey-like across the horizontal roof. There is no doubt such problems are enjoyable, and many are quite challenging; it’s easy to see why they are so popular. The problem is, in order for us mortals to climb these too-steep features, we require enormous holds that are too big to properly stress the finger flexors (instead emphasizing shoulder, upper arm, and back strength). Holds like this are skin-friendly, fun to climb on, and minimize the risk of finger injury. Unfortunately they don’t exist in the real world, so they offer little training value. This situation would be dire enough, but often the lack of realism is further compounded by exotic hold shapes (massive volumes, slopers, jugs, and other protruding features that are easily pinched). The third strike comes in the shape of relatively enormous, incut footholds that encourage huge moves and minimal core tension. 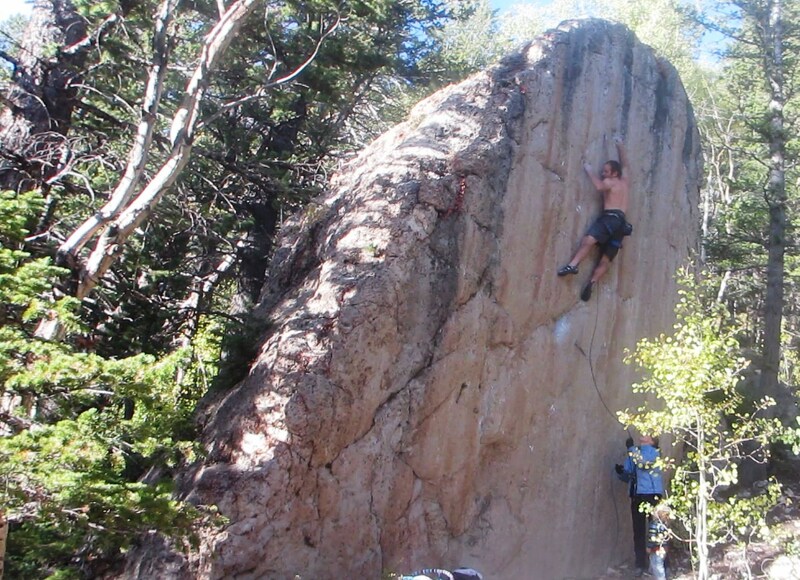 Put these factors together and the result is a smorgasbord of problems that are a whole of fun to climb but provide little training benefit to actual rock climbers. 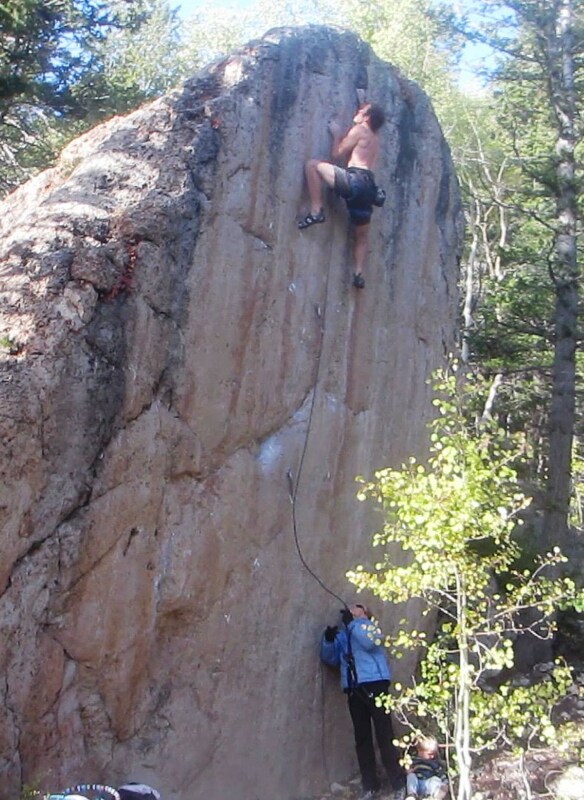 Hard rock climbing in America is about pulling on small edges and pockets, while standing on tiny footholds on near-vertical terrain. The ability to campus from one lightbulb-shaped protrusion to the next has no relevance. If you train at a public facility where you are unable to set your own problems, talk to your routesetters &/or gym management and encourage them to set problems that facilitate effective training. Gyms want to make their customers happy, so tell them what you want. They may even allow you to set some of your own problems. If that fails, make up your own problems linking in situ holds, or use the gym’s System Board to create your own problems (often System Boards are covered in a variety of realistic holds). 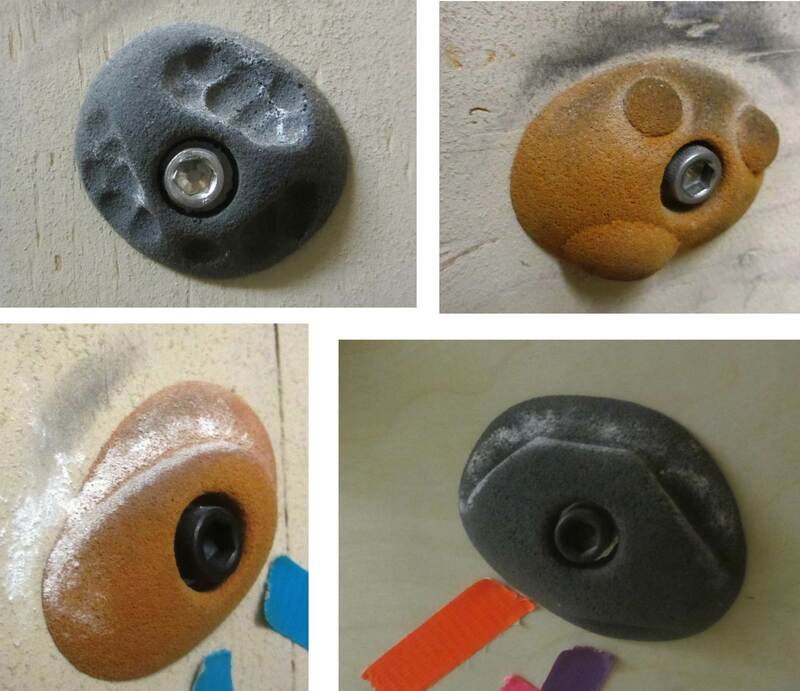 For those that set their own problems, below are a few recommendations of some of my favorite hold sets. If your local gym is lacking, consider recommending some of these sets to the routesetters. 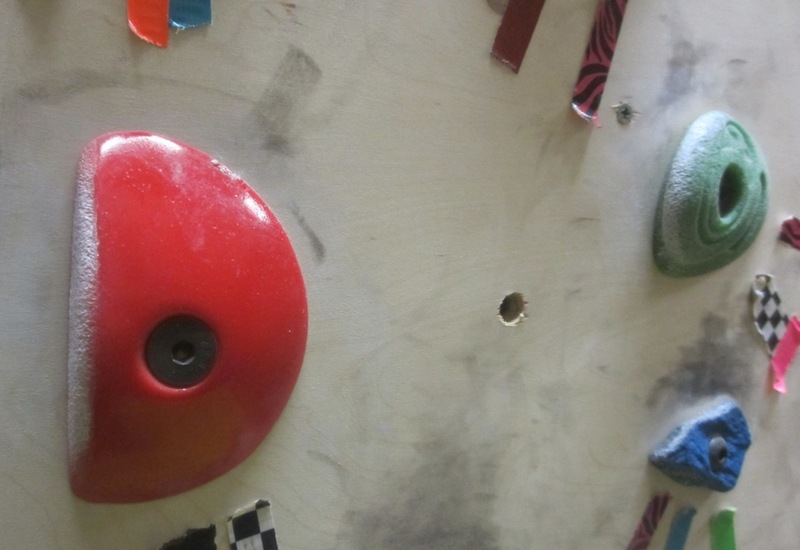 One general piece of advice: invest in high quality holds, especially if you have a small climbing wall. Good holds will keep you psyched much longer, and allow you to make the most of your training time. 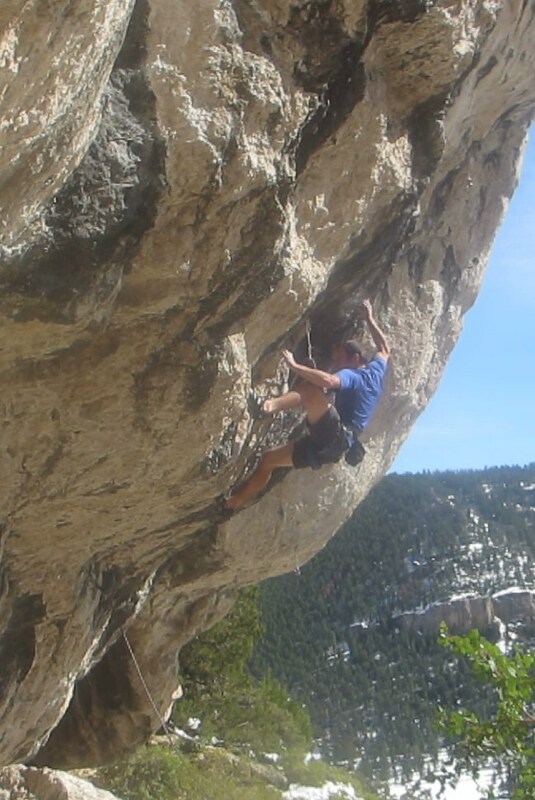 You’ll get far more mileage out of 10 good holds than you will out of 20 low-quality holds. This pic of one of my “Comfy Crimps” says it all. You know a hold is good when you see 12 pieces of tape next to it! 1. e-Grips “Comfy Crimps” These were my first set of holds, and they’re still one of my favorites. These edges are easy on the skin and rather incut. These are great for 5.12-ish climbers on a steep (~30 degree) wall. 2. e-Grips “Midnight Desert Crimps” This set includes a variety of sizes and shapes, that are generally a number-grade or so more challenging than the Comfy Crimps. Most of these holds are ideal on vertical-to-slightly-overhanging terrain, though some of the larger holds can be used on the steeps. 3. Entre Prises “Super Tweaks” These holds were the secret to my speedy ascent of To Bolt Or Not To Be. The north wall of the Lazy H is dead vertical and plastered with these irregular, sloping edges. These are nearly impossible to pull out on, so they require great balance and footwork. Perfect for improving technique on a vertical wall. These will challenge climbers form 5.11-5.14 depending on how they’re used. 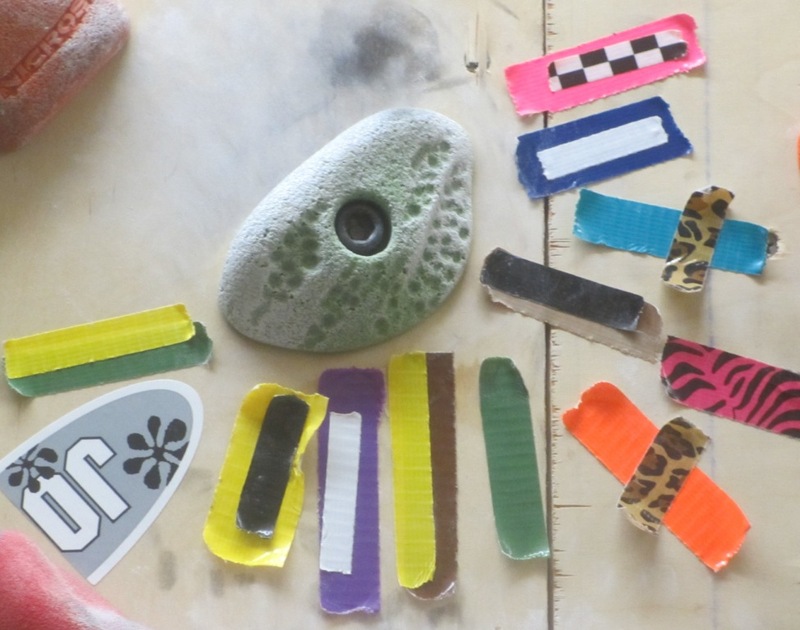 Super Tweaks: These make challenging hand and footholds, depending on how they’re oriented. 1. e-Grips “Ian’s Tribal” These guys are brutal–the most challending set in this list–they will transform you into a crimping fiend, assuming you can pull off the ground. 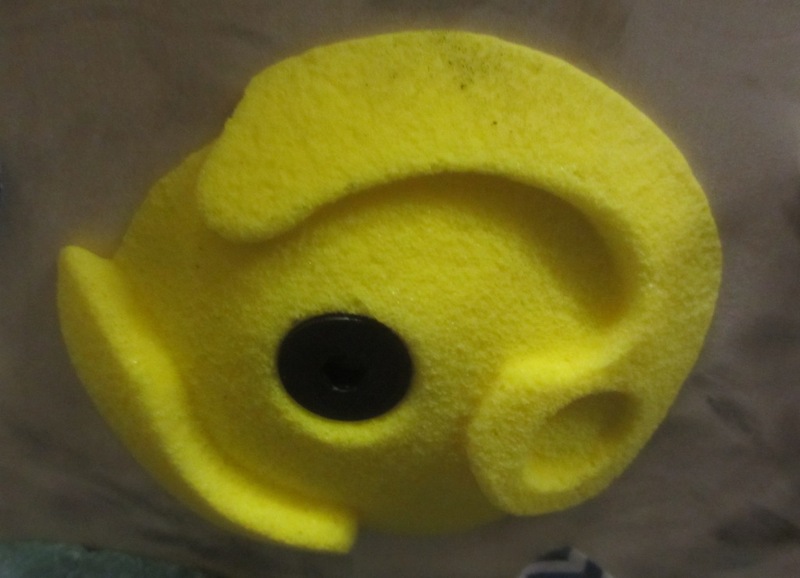 These are 5.14 holds when mounted on a 30 degree overhang. Nearly all of my hardest Limit Boulder problems feature one or more of these. The pocket that comes with this set is also my favorite two-finger pocket (when oriented horizontally) and my favorite mono (oriented vertically). Three of my favorites: 2Tex Pure Crimp in red, Ian’s Tribal in green, and Supertweak in blue. 2. e-Grips “2Tex Pure Crimps” These edges are awesome. They feature glassy-smooth texture on the backside so they are impossible to use as footholds. These are ideal when you want a sidepull or undercling that won’t produce a huge foothold. Most of these aren’t very incut, so they’re 5.13/14 holds on steeper walls, but 5.11/12 on less-steep walls. 3. e-Grips “Buttons” These are generally small, but very incut edges. Some of these can be used as footholds, some as handholds, but they work best overhanging terrain. These can be in the 5.12 range when used on a 10-degree overhang, up to 5.14 on a 30 degree overhang. 4. e-Grips “Hueco Patina Flakes” These are small but very incut edges. They’re much more irregular than most edges, which can provide a nice change of pace. Often you can get your fingertips “behind” the incuts on these, making them ideal for steeper terrain. These are generally a bit bigger/easier to use than the buttons. 1. e-Grips “Fossil Pockets” These pockets are smooth, deep, incut, and ergonomic. They’re on the large side, making for 5.12/13 terrain on steeper walls and 5.11/12 terrain on less steep walls. 2. e-Grips “Limestone Pockets” These are much more challenging than the Fossil Pockets, and the set includes a couple of mono pockets. 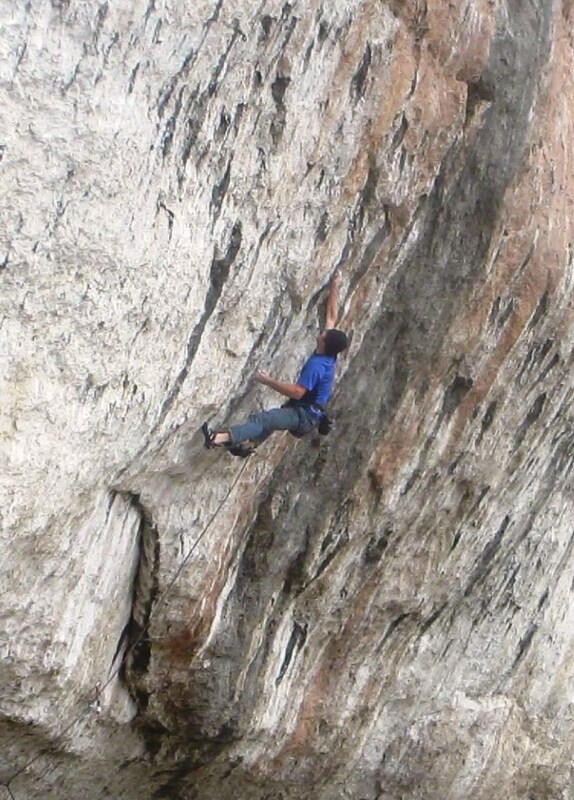 When oriented slopey-side-down on a steep wall, these are 5.14 holds. When used right-side-up on vertical to 10-degree overhangs these are in the 5.11/12 range. 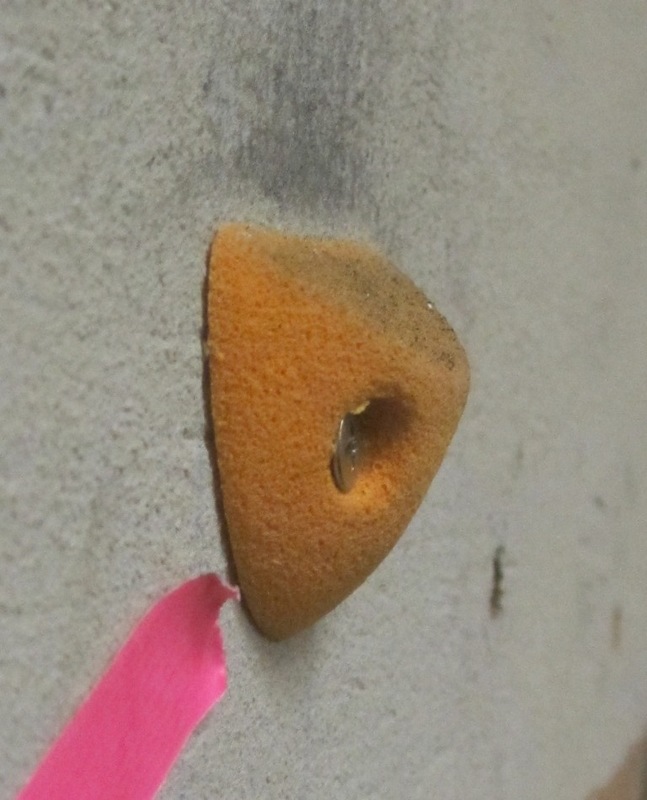 Drop Art Footholds: Many options for orientation, and some can be used as wicked hard crimps. 1. e-Grips “Double Disks” These are highly intricate footholds that require very precise placement and good core tension. Some of these holds can be used as hand holds too. 2. e-Grips “Drop Art Footholds” These are intricate footholds that aren’t quite as hard to use as the Double Disks, but they each offer many foothold surfaces so you can rotate them as they wear out. A few of the larger holds in this set can be used as vicious crimps. 3. Screw on Jibs. These are available from various manufacturers, including Revolution and Metolius. They’re cheap, easy to install and offer some very challenging shapes. Unfortunately they’re beginning to vanish from the market as gyms adopt elaborate wall surfaces that won’t accept wood screws. Small, sloping jibs like this one from Revolution are great for vertical walls and “kick plates” below steeper walls. 4. Atomik “Bolt-On Feet” These holds are a bargain, but still offer some really interesting and challenging shapes. They all require accurate foot placements, and a few of them can pass for handholds on vertical walls. Atomik Bolt-on Feet offer a lot of variety at a low price. Over Easter Weekend the family and I flew out to San Diego to visit our good friends Rob and Julie and their toddler Samuel. The first day we headed out to JTree for some mellow sight-seeing and car camping. This wasn’t a climbing trip but I couldn’t pass up the opportunity to check out JTree’s amazing boulders. My friend Will has a house near there and he hooked me up with a few crashpads and a guidebook. It always helps to have nice tall stack of pads, and the guidebook was a huge help. I’ve heard it can be hard to find your way around the maze of boulders and jumbled rock formations, but the Miramontes guide has great maps and photos and I was able to find everything with only a small amount of aimless wandering. The bouldering was really outstanding. I didn’t know what to expect since the rock at JTree is notoriously fickle, but all of the problems I did were amazing. I spent most of my time in “The Outback”, but also tried a few things in Hidden Valley. The rock is sharp for sure, but its not all thin edgeing and smearing. There are a lot of huecos and scoops, and even though edging is my cup of tea, I really enjoyed the steeper, thuggier problems too. I would go back in a heart beat, but probably not in late March. It was really hot for my taste (75 deg F), which limited my options quite a bit. We also did some hiking and what I would call “wandering”–trying to get lost in the amazing landscape. Joshua tree is completely surreal. Its a great place to explore and linger. We headed out toward the Astrodomes and found some cool rock tunnels. Logan had a blast crawling around the tunnels, and managed to burrow himself into several chambers that we couldn’t reach. 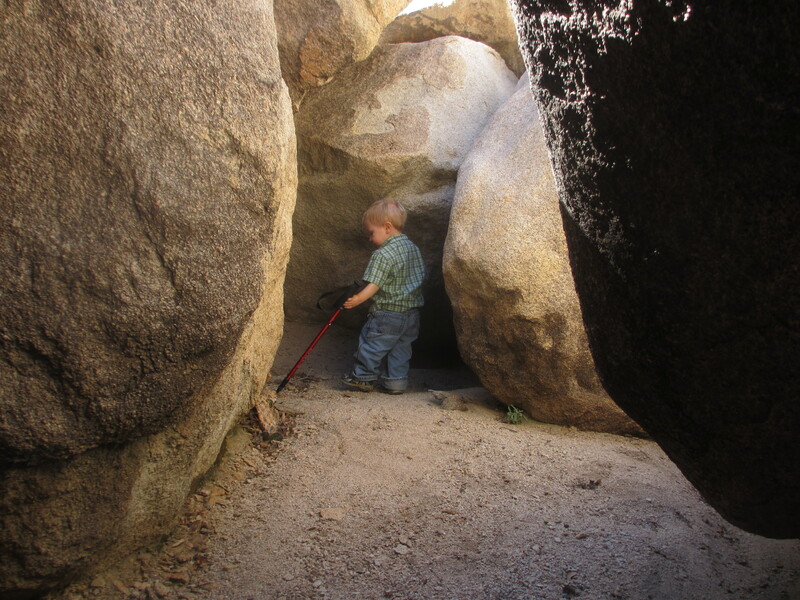 Logan tunneling around in the Wonderland of Rocks. 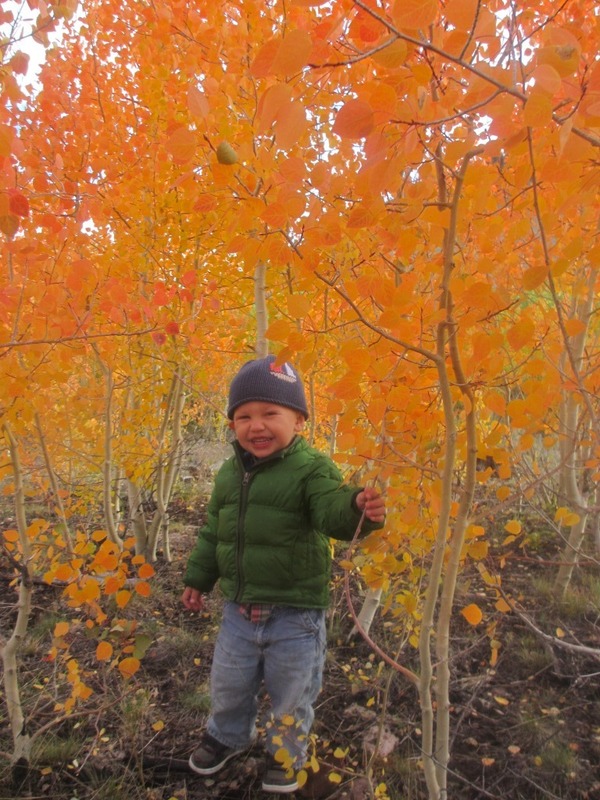 Logan loves to scramble around no matter where he is: the house, the park or in the wild. I’d love for him to be a climber at some point, but I don’t want to push him into, so I’m psyched that he seems to have some inate interest in climbing. 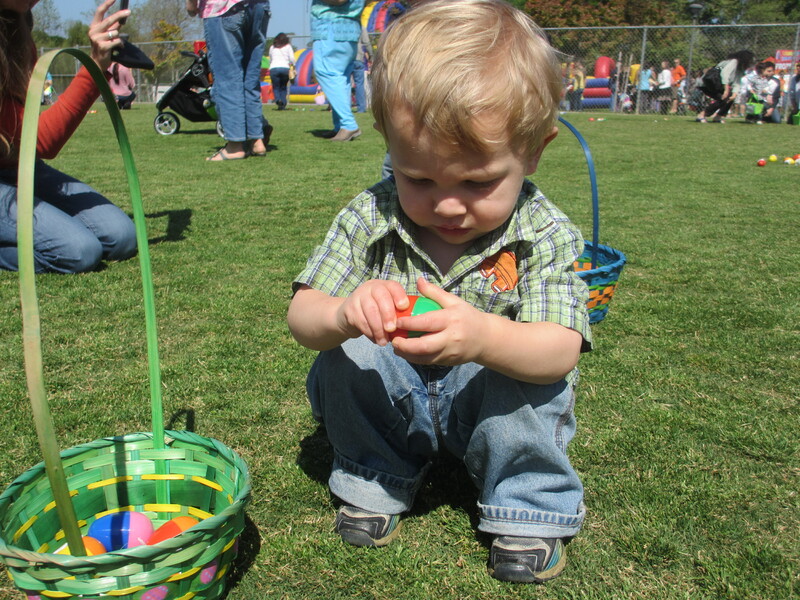 After our all-too-brief stay, we headed back to San Diego for an obligatory Easter Egg Hunt and a beach trip. Rob is my surfing coach, so we headed out for some waves. I’m not any good but California seems like a great place to learn, in my limited experience. The surf was tiny (2-3 feet), but we were able to catch most of the waves we tried for and we had a great time. 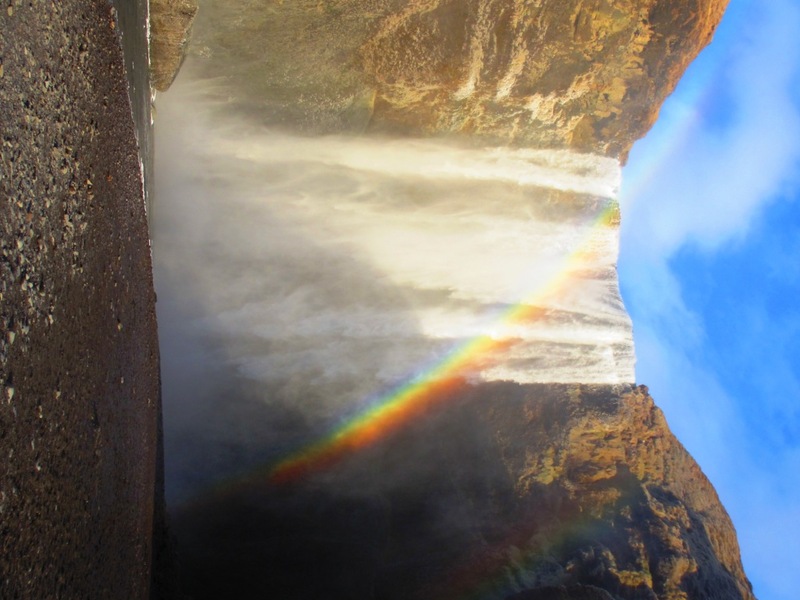 Remember how I went to Iceland? Well, finally, here is the highly anticipated conclusion. If you missed them, check out Part I and Part II. 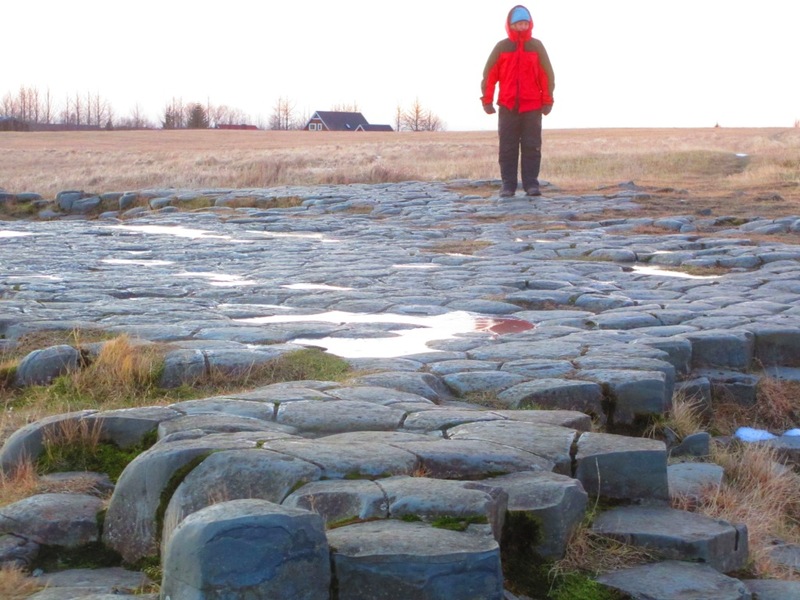 Day three started in Kirkjubaejarklaustur with an extensice complimentary breakfast at the hotel followed by a couple of quick stops on the way out of town to look at some promising rock formations. 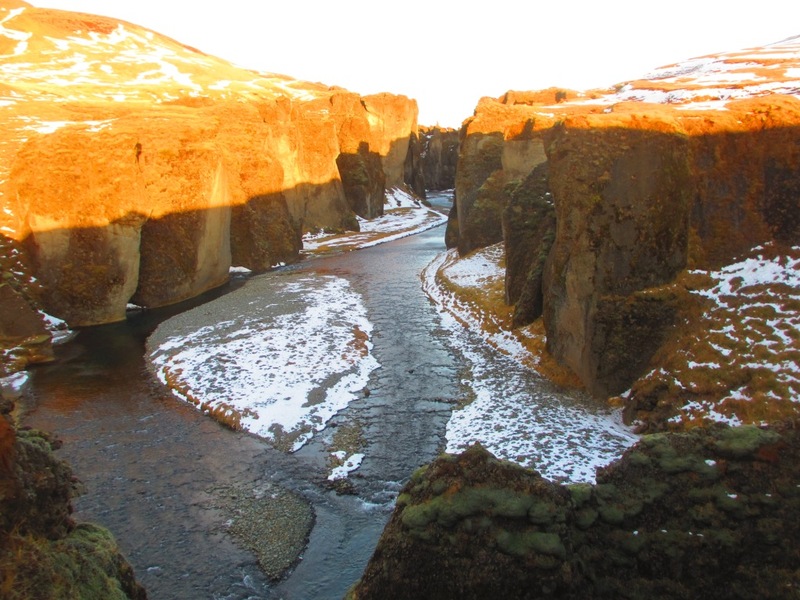 The volcanic tuff-lined Fladrargljufur gorge had some beautiful towers and buttresses, but unfortunately the rock was some of the worst I saw on our trip. 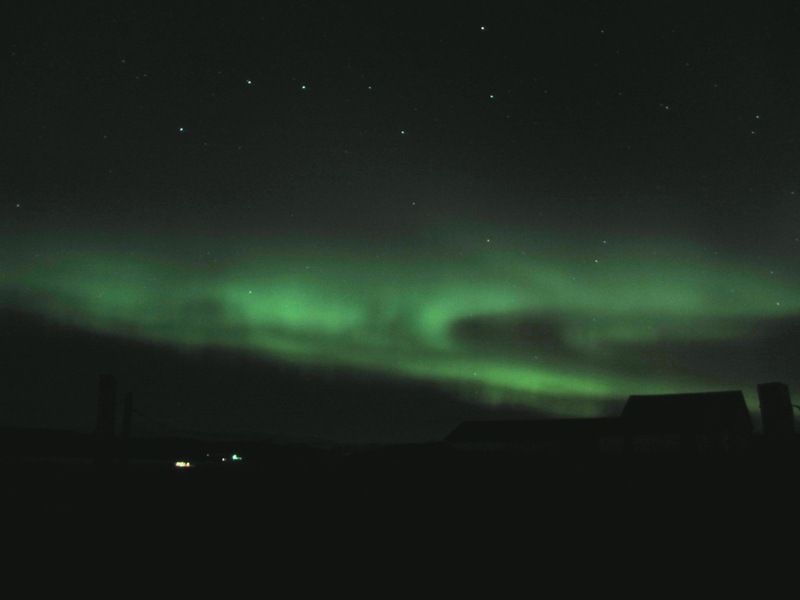 The wind was raging all day, and it really showed how fickle the weather is in Iceland. The wind made the differnce between T-shirt climbing in the sun, to completely unbearable even in a hooded puffy, and it went form to the other almost instantly. The penetrating chill kept us in the car almost the entire day, but we were able to find a few sheltered spots to enjoy the amazing scenery. We also got a chance to inspect a herd of Icelandic sheep up close along the drive. These sheep are considered the most pure breed in the world, and their wool is one of Iceland’s key exports. Everywhere you go wool sweaters, gloves and hats are for sale, but a regular wool sweater will set you back $180! The sheep are really fun to watch, with a hilarious waddle-like gate and enormous fluffy coats of wool. 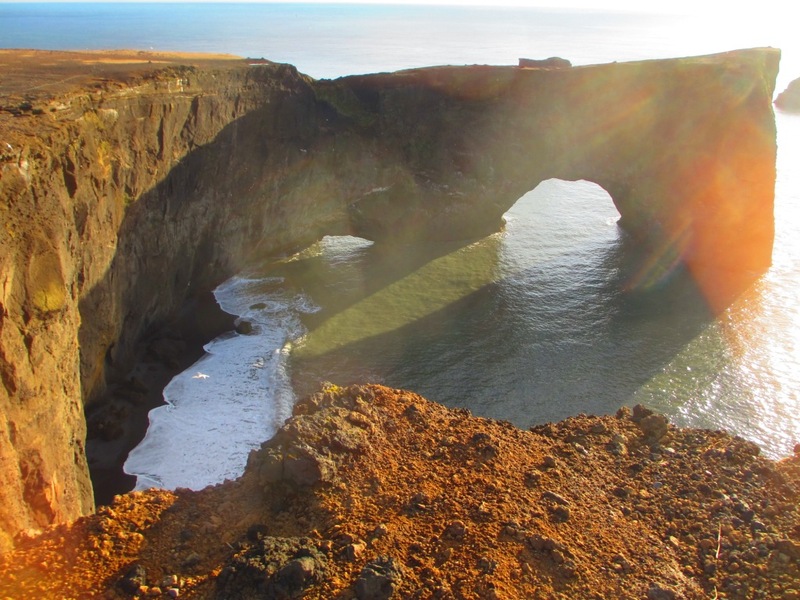 The next major destination was the coastal town of Vik and the nearby Dyrholaey sea arch. I’ve seen quite a few sea arches around the globe and this was easily the most massive I’ve ever seen. You could sail a decent sized ship under the thing, and that is in fact one of the primary industries in Vik (shuttling tourists under the arch). That isn’t really our kind of thing so we admired the arch from the lookout. The day before while browsing in a gift shop I saw a postcard that showed a promising escarpment of basalt columns on a black sand beach with the arch behind. 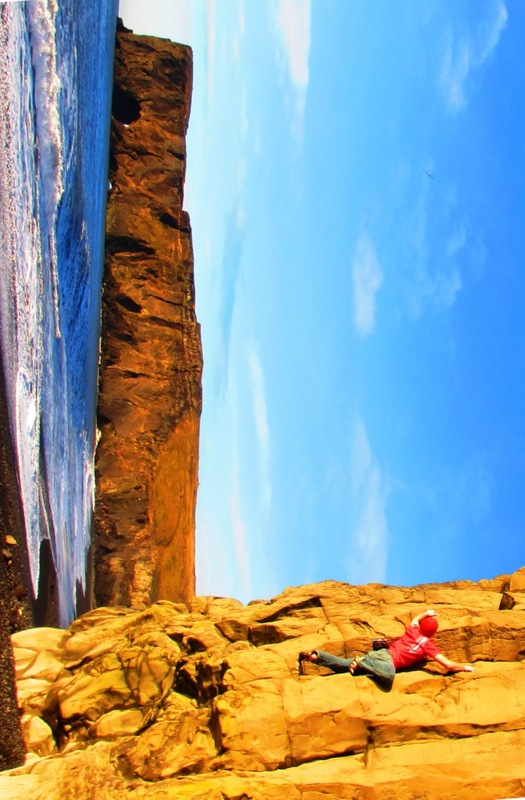 I made a point to find this beach and explore the climbing potential. I either failed to find the correct beach, or the postcard was heavily photo-shopped, because I never found the idyllic view pictured in the post card, but I did find a beautiful sheltered cove of impeccable basalt. Most of the seaside cliffs I’ve seen are decomposed garbage due to the harsh weather conditions, but this rock was completely flawless, and even featured some aesthetic marble green swirls in the stone. There was a nice sized cave with some intriguing horizontal potential, but most of that stone was dripping wet, so I focused on the nice cliff to the left. The cliff is at least 40′ high, and interesting enough to warrant atleast a toprope if not a rack. The bouldering was excellent with perfect sandy landings. Next on the agenda was a pair of outstanding waterfalls famous waterfalls. It was pretty amazing how much the landscape had changed in only 24 hours. When we blew by these falls the day before they were falling straight down and surrounded by lush green moss. Now they were falling sideways and all everything was plastered with ice for 50 yards in every direction. Skogafoss was the first and we stopped in the gift shop for lunch where I enjoyed the most hilarious “sandwich” I’ve ever had. This feat consisted of two slices of white bread with a single slice of lamb, literally 1/16″ thick. It was actually really tasty thanks to a healthy serving of honey mustard but I’m skeptical of its nutritional value. We were beginning to get the feeling we may not see the Northern Lights on this trip so we took some photos of the dramatic posters in the gift shop just in case. 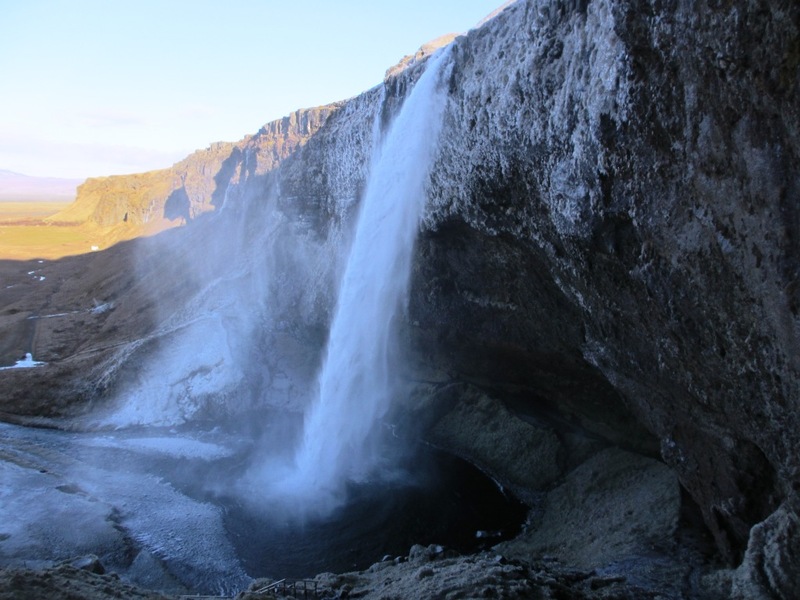 After a brief and bone-chilling stop at the dramatic Seljalandfoss we continued on to Hveragerdi to search for some of the delicious pastries we had heard about and check out the nearby Reykjadalir geothermal site. There was an impressively large boiling mud pit and a convenient “hot pot” that wasn’t really warm enough to compensate for the incessant wind. 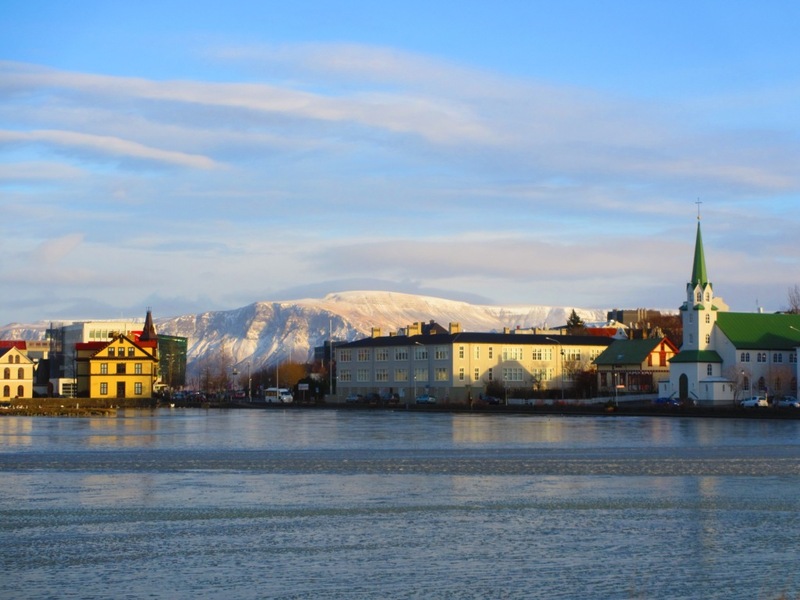 We headed to Reykjavik to finally check out some of the city sights, get some dinner and hopefully some rest before heading out again in search of the Aurora Borealis. 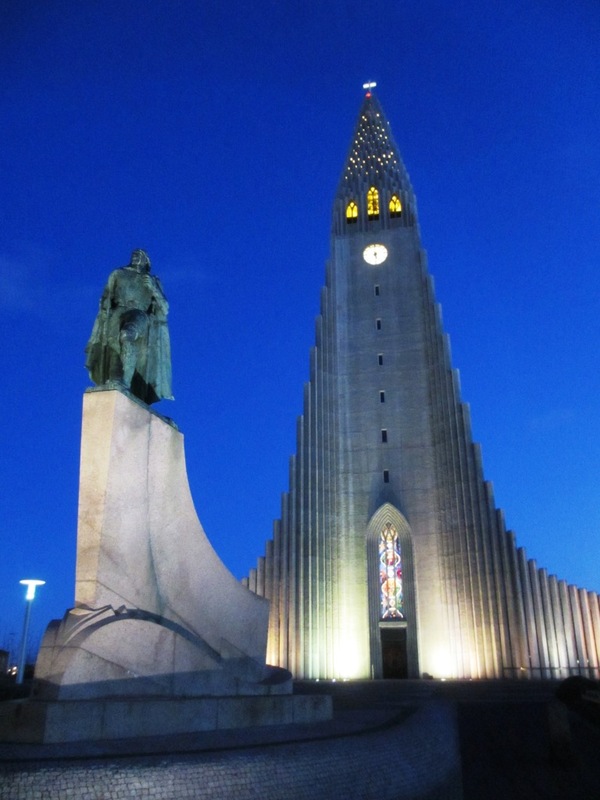 Reykjavik was quite “quaint” for a capital city, and has some interesting architecture. The best way to describe the urban areas is “punk”, with lots of graffiti and murals coating the alleyways. The centerpiece of town is the Hallsgrimkirkja church, situated at the top of the hills, with streets plunging steeply down the hill in every direction like a miniature San Fransisco. 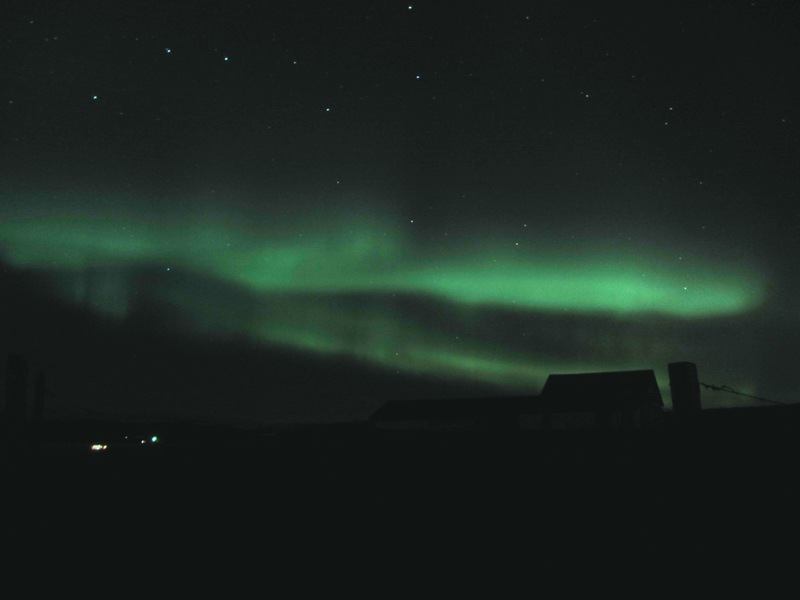 After dinner we returned to our hotel to get some rest and finalize our plans for Northern Lights hunting. We planned to head out around 8pm and head straight east. 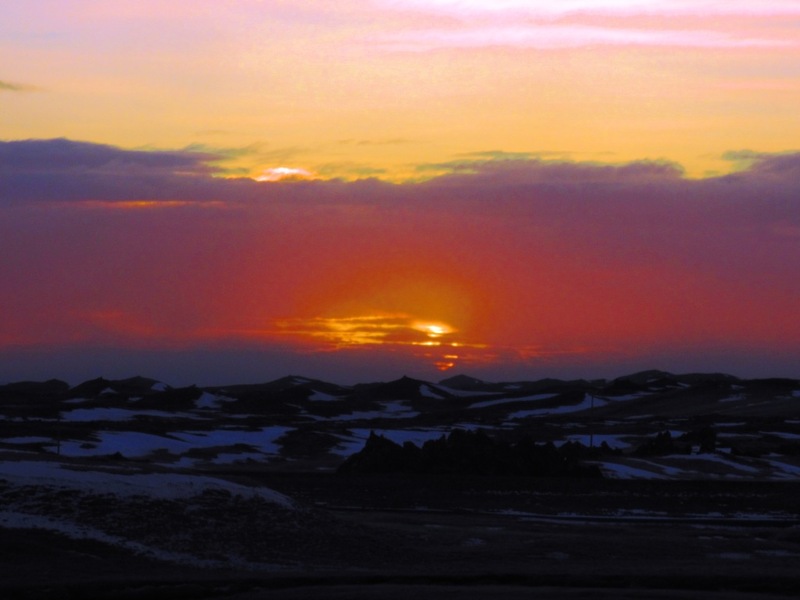 We initally stopped about 20 miles east of Reykjavik in the middle of a large snow-covered lava field. 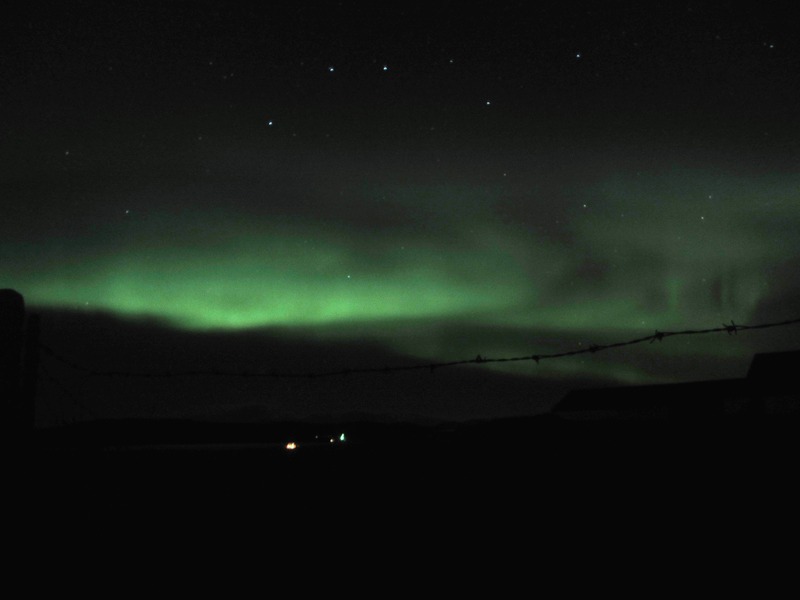 There were some faint glows on the horizon that gave us hope, but it was clear we were still too close to the city, so we continued east on Highyway 1 with the plan to eventually head northeast towards Thingvellir National Park. We stayed until the lights began to fade and then slowly made our way back to Reykjavik, stopping from time to time to get another look. We arrived just before midnight exhausted but satisfied. These are all 15 second exposure with heavy post-editing. Longer exposures would be better, but that is the most my camera would do. By day number four we were pretty much tapped out as far as tourism was considered, so we headed a bit north of town for a nice scenic hike. 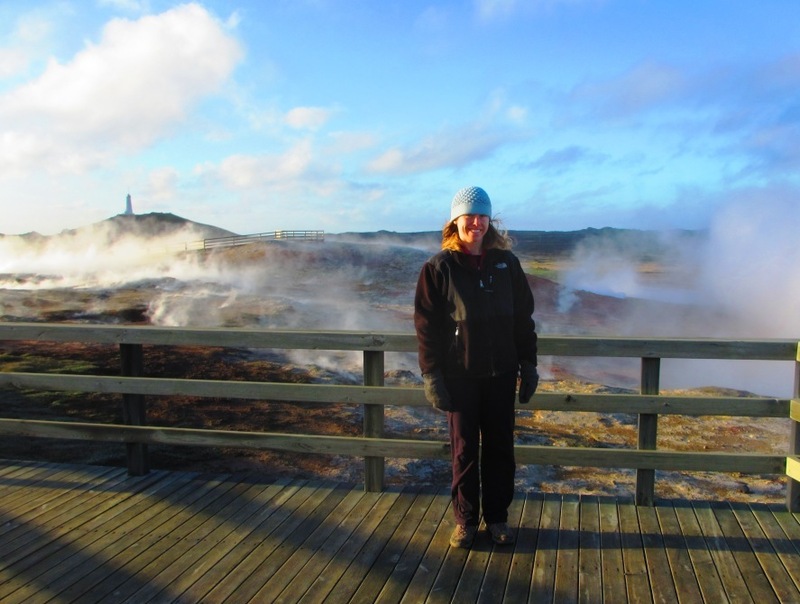 Next we headed to the Reykjanes Peninsula to explore the dramatic volcanic landscape and see a few sights on the way to the airport. 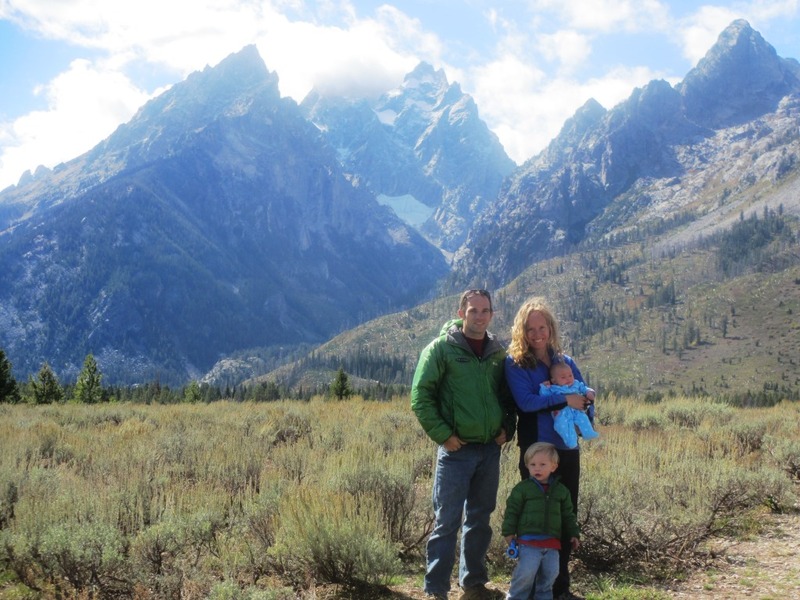 The peninsula has some tempting mountains that would be casual dayhikes. 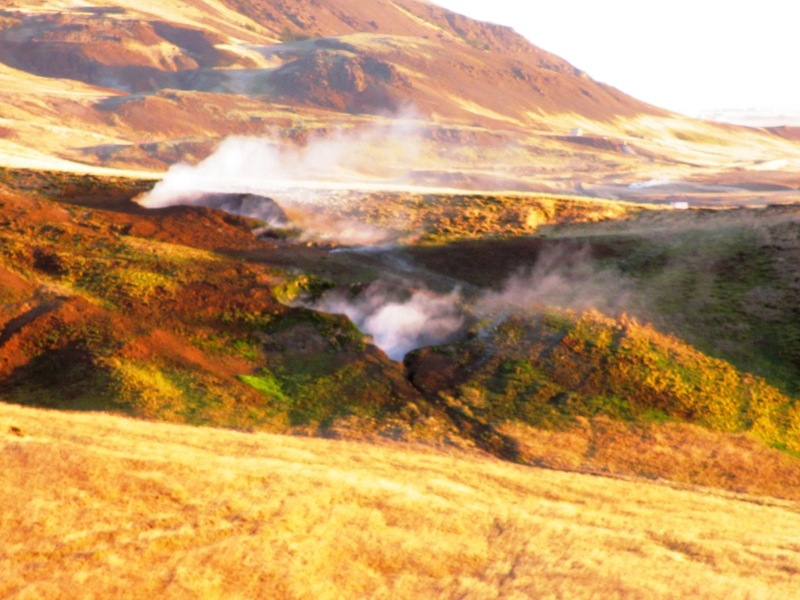 We stopped at the Gunnuhver geothermal area which produced overwhelming amounts of steam and fueled a nearby geothermal energy plant. 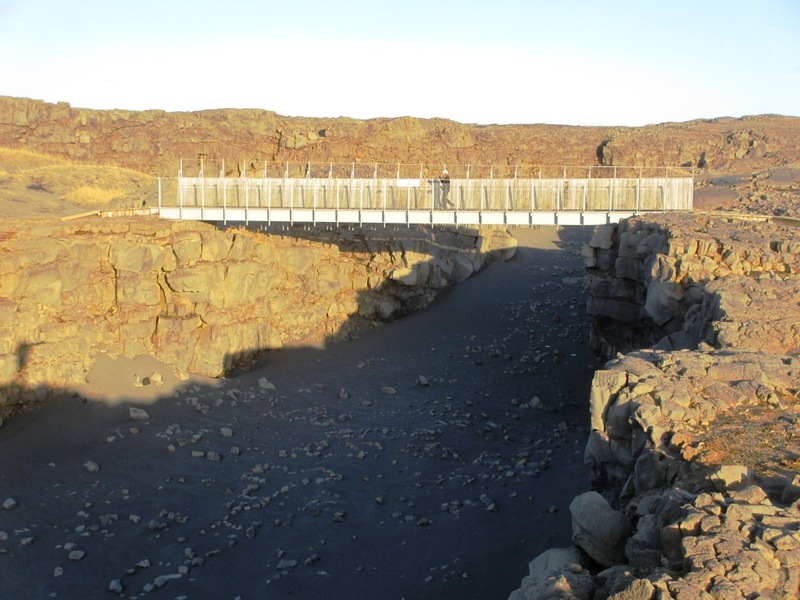 The final stop was the “Bridge Between Two Continents”, a cheesy metal footbridge that spans an exposed section of the Mid-Atlantic Ridge. 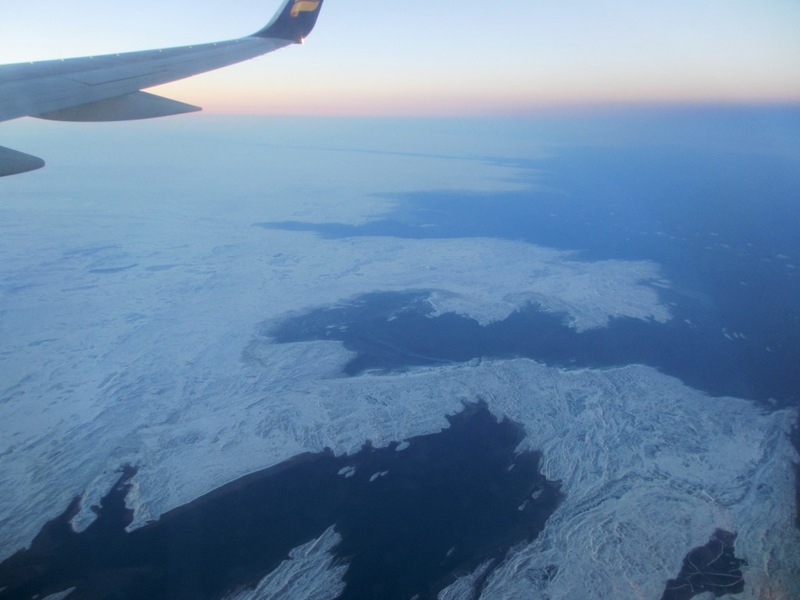 Northeastern Canada from the plane.